Billed as the most powerful storm brewing on Earth at this time, Super Typhoon Mangkhut is continuing to gain strength. The diameter of the typhoon's eye now measures 50km, nearly the size of Hong Kong. Meanwhile, the radius of the entire storm has expanded to nearly 300km. Although the typhoon has edged south away from a direct hit to Taiwan, the Central Weather Bureau issued a sea warning today, and eastern and southern Taiwan should expect heavy rains over the weekend. Super Typhoon Mangkhut is wreaking destruction as it advances toward the Philippines. In Eastern Taiwan, the typhoon’s periphery whipped up waves as high as five meters. 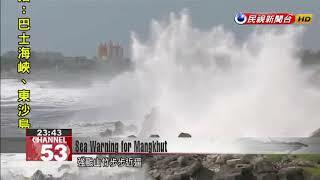 Since this morning, the wind and the waves have been intensifying aroundHoubi Lake of Kenting.After the Central Weather Bureau issued its sea warning this morning, surfers were prohibited from entering the ocean. For hoteliers in the area,the storm has delivered a blow to business. News of the incoming typhoon has scared everybody away. About two-thirds of our bookings have been canceled. Heavy rain ravaged Kaohsiung at the end of August, pitting the roads with potholes. City officials are rushing to repair the holes before more rains arrive. For almost two months straight now, we’ve been doing road control and monitoring for these repairs nearly every single day. According to the Central Weather Bureau, Super Typhoon Mangkhut will reach the west end of the Bashi Channel tomorrow morning and deliver heavy rain to Eastern and Southern Taiwan over the weekend.